The story of the Charities began in 1603 with a legacy from John Wrench, who was the tenant farmer of land now occupied by Stamford Street, and over the past 400+ years that original bequest and over 40 other legacies have grown into the organisation which is now known as Southwark (Christchurch & St Mary’s) Charities. The Charity was established under a deed of gift by Edward Edwards, a Stone Mason and a parishioner of Christ Church, Blackfriars, dated 2 November 1717, to build and maintain Almshouses which would provide shelter for “poor decayed housekeepers and widows” (“not receiving any alms or pension from the said parish or any other”), each of them to receive 40 shillings (£2) a year and a gown of a purple colour “without any badge” every two years. Edward Edwards’ gift was the rents on some messuages (dwellings) on Upper Ground on which he had a long lease; the trustees were charged firstly with collecting sufficient rents to buy a suitable plot of land, then secondly to collect sufficient rents to erect almshouses on it. A plot known as the “Physick Garden”, close to Christ Church, comprising an area of 2 acres, 2 roods and 27 perches (1.08 hectares, or 10,800 square metres) plus 6 old houses fronting the Green Walk (today’s Burrell Street) was purchased for £350 in 1752, and the first almshouse was built the following year. Further almshouses followed, after the laying out of Blackfriars Road. By the 1820’s the trustees had continued to invest and extend the almshouses and there were 44 almswomen by that date. In 1861 the London, Chatham & Dover Railway compulsorily purchased 11 houses at the eastern edge of the estate to lay the viaduct carrying the line into Blackfriars Station. The Charity became known by the name of Edward Edwards’ Charity by the formal Scheme dated 29th July 1890 upon the direction of The Board of the Charity Commissioners for England and Wales. In 1891 the original Almshouses were demolished and over the next few years new Almshouses consisting of 40 rooms were constructed. Those dwellings were in use up to 1973 when the current Almshouse was opened by HRH Princess Anne. In 2005 the existing Almshouse, which then comprised 38 bed-sitting rooms with a separate kitchen & bathroom, was converted into 20 one-bedroom flats, and the kitchens and bathrooms were upgraded at the same time. 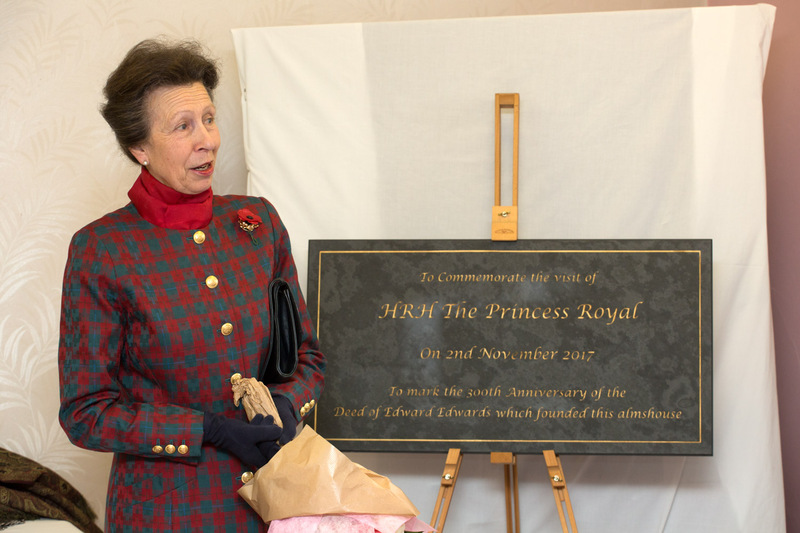 In 2017 Edward Edwards’ Charity celebrated its 300th anniversary, and HRH The Princess Royal joined Trustees, Residents and Staff to mark the occasion. As can be seen, many of the gifts were expressly for the purchase of the absolute necessities of life, i.e. food and clothing. Nowadays a sum of money is given instead. The Charity was established by a Scheme of the Commissioners dated 12th December 1905. It combined various gifts made by the Vaughan family, wealthy hat-makers in Blackfriars, who supported a number of local Charities. They also endowed Almshouses for 24 women which were located on the corner of Union Street and Great Suffolk Street, until their removal to Ashford MIddlesex in the 1890s. In 1852 Elizabeth Vaughan gave a sum of £200, augmented with an additional £300 from her children George, Henry & Mary, to make a regular cash gift to the almswomen residing in Edwards’ Almshouses. Shortly afterwards Mary Vaughan gave £400 to provide the women in the almshouse with 5/0d worth each of tea and sugar every year, the quantities supplied being two pounds of loaf sugar, one pound of black tea and a half pound of fine green tea. The original scheme of this Charity dates from 27th November 1885 and occupied premises known as the Albert Institute located in Robert Street (now Chancel Street), Blackfriars under a lease granted by the Edward Edwards’ Charity for a term of 80 years from the 24th May 1886. However, this was actually the second building by the name of the Albert Institute, as the first one, erected using funds collected over many years by the Reverend Joseph Brown, Rector of Christchurch, was built in 1859 in Gravel Lane (now Great Suffolk Street), on the eastern side of the railway, but 13 years later it was subject to compulsory purchase to enable the east/west and north/south railway lines to be connected via a bend, and was demolished in 1875. The Scheme of the Commissioners dated 12th July 1901 provided for the letting of the building for educational, philanthropic or other public purposes but no such lettings were to interfere with the enjoyment of the Institute by poor persons. The provisions of the aforementioned scheme continued to apply up to 22nd September 1972 and the lease having expired the building reverted to the Edward Edwards’ Charity. During the inter war years the name of Robert Street was changed to Chancel Street and following the expiry of the lease, the Edward Edwards’ Charity let the property to the Electoral Reform Society. In 2015 the Philharmonia Orchestra administration moved in. The Scheme of the 22nd September 1972 defined the objects as being the relief of the aged, impotent and poor inhabitants of the area of the former Metropolitan Borough of Southwark, the relief of distress and sickness among the said inhabitants and the provision and support of facilities for recreation or other leisure time occupations. The Marlborough Street Estate refers to houses on a site adjacent to the Christ Church Workhouse in Marlborough Street, roughly where the Lambeth/Southwark College is today. The rents from these houses provided an income for the Albert Institute. The United Charities were established by the Scheme of the Commission dated 5th July 1904. Just as in the parish of Christ Church, this Scheme combined a number of charitable gifts including the Henry Smith Charity, the Copyhold Estates Charity, the Elephant & Castle Charity, the King & Queen Charity and Mann’s Annuity Fund. The earliest provision of almshouses in the parish of St Mary Newington were those endowed by John Walter, the Clerk to the Worshipful Company of Drapers, in 1642. They were erected on some waste land acquired from the Lord of the Manor between what is now Newington Butts and Walworth Road. Accommodation was built for 16 almspeople nominated by the parish and by the Drapers’ Company. They were rebuilt several times over the centuries. In the 1970’s John Walter’s Almshouse was rebuilt and located in Brandon Street, Walworth SE17. The Elephant & Castle Charity began with a grant of land in 1658 which would later become the long island at the junction where Newington Butts met Walworth Road. The rents and profits arising from the premises erected on this land were to be given to the overseers of the poor and the church wardens of the parish for the relief of the poor. In 1852 the Elephant & Castle Charity and the King & Queen Charity (both of which derived the bulk of their income from the eponymous public houses!) were merged, with provisions made for the payment of pensions and the erection of almshouses. Land on the corner of Hampton Street and Clock Passage was bought in 1894 for £1,250 and four almshouses erected at a cost of £4,044. Each house accommodated four people. The almshouses in Clock Place, off Hampton Street, along with two shops opposite, were the only buildings in the street to survive the bombing in World War II, and, as part of redevelopment plans, the almshouses were compulsorily acquired by the Greater London Council and Southwark Council as part of the Elephant and Castle Redevelopment Plan. 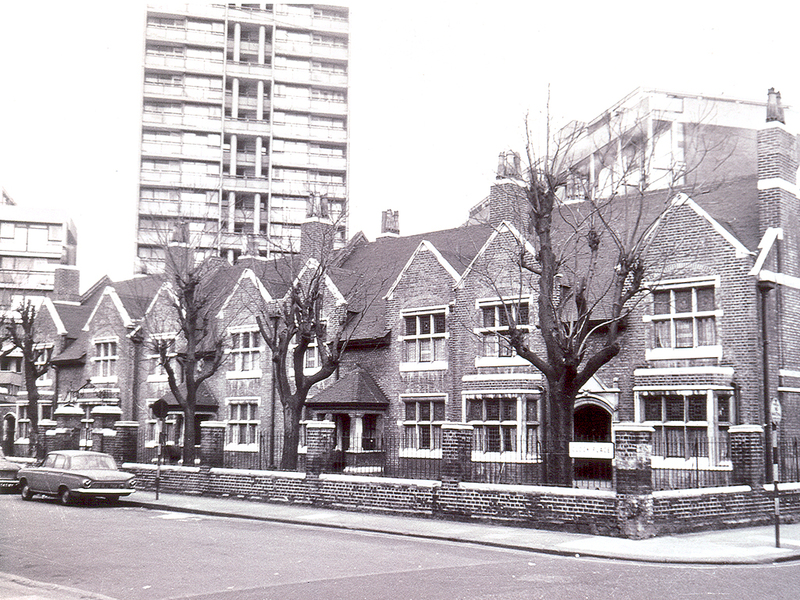 The Council offered an alternative site for the St Mary Newington Almshouses in Surrey Square, just south of East Street in Walworth, where a new 41 flat complex was opened in 1969. The Charity continues today very much as when established by the scheme of 1904 apart from minor administrative changes by subsequent orders of Commission over the years. The Charity was established by a scheme of the Charity Commission dated 1904, to provide financial assistance for educational pursuits. The scheme provides for not less than 40% of the annual income to be distributed to four named Church of England Schools in the ancient parish of St Mary Newington. These are St John’s, St Peter’s and St Paul’s, Walworth, and the school now known as Ark All Saints Academy (the successor of Archbishop Temple Secondary School). The remainder of the income is to provide grants for educational purposes to pupils residing in or attending schools in the area of benefit. Joseph Collier was a resident of Southwark and the proprietor of a Drapery Store located at the Elephant & Castle. The Joseph Collier Holiday Trust was established by a scheme of the Charity Commission in 1966 following the bequest by Joseph Collier to provide a holiday home for persons over the age of 60 and residing in the area of the former Metropolitan Borough of Southwark. A property was acquired in Bexhill but unfortunately due to ever rising costs the property was disposed of and the proceeds invested. The Trust now makes grants of up to £200 to individual applicants residing in the area of benefit and who qualify by reason of their age as a contribution towards the cost of a holiday.